The first couple of live dates for 2019 are confirmed!.. On Friday 8th February I'll be playing a solo acoustic set at The Classic Grand in Glasgow as part as a fundraising night for The Panopticon Music Hall. I'm especially pleased to be taking part as The Panopticon was very supportive last year in allowing the 'NY Reflection Song' video to be filmed there as well as an Infomaniacs live show at the historic venue in September. 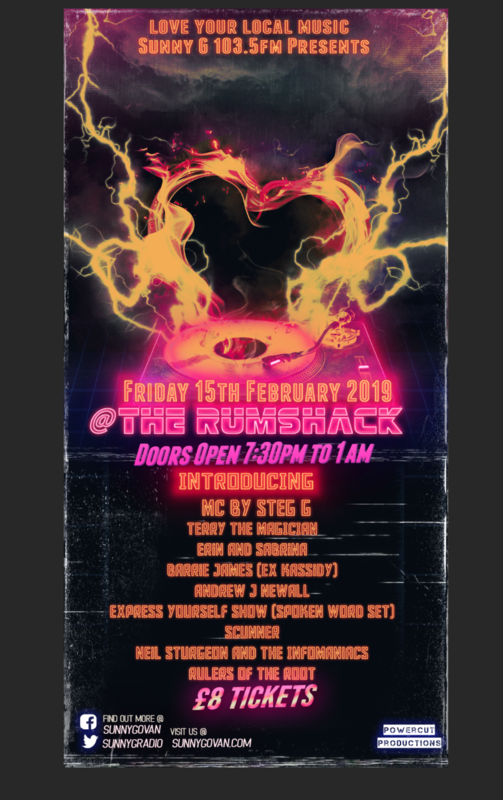 A week later on Friday 15th February the first Neil Sturgeon & The Infomaniacs live date of 2019 will be taking place at The Rumshack in Glasgow. This event is also a fundraiser, this time for Sunny Govan Radio who also showed us great support last year in playlisting the 'Geography & Luck' album..the album was also awarded 'album of the week' status on some SGR shows and we are delighted to to take part in what I expect to be a highly entertaining evening. The Infomaniacs line up for this one will feature Neil Menzies (Bass), David Andrews (Lead Guitar & Vocals), Marc Tuffley (Drums & Vocals) and myself on vocals & acoustic guitar. For stage times, ticket info and details of the other acts appearing at both events please sign up to the Neil Sturgeon Music page on facebook and I'll keep you up to date as all the relevant info is revealed. There's lots more live activity on the horizon for the first few months of this year and we have started work on some new songs with a view to recording a new single EP in April. Thanks to everyone who supported us in 2018, especially those of you who bought the album and helped to get the word out there. The response to the 'Geography & Luck' LP was fantastic and I look forward to getting some new music out there very soon. 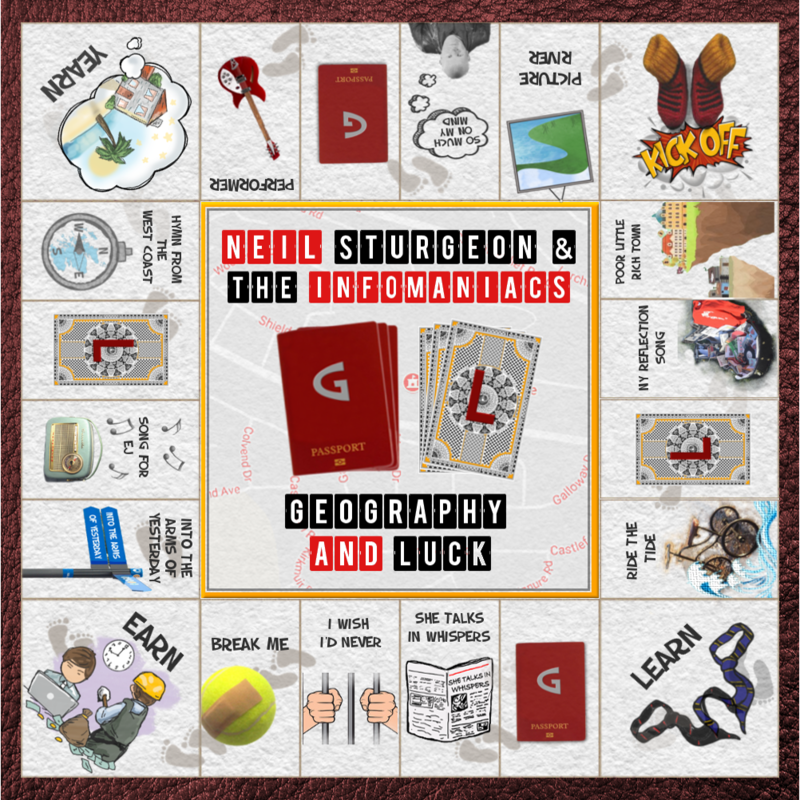 The 'Geography & Luck' album has now been officially released and I'd like to thank everyone who has bought it so far, your support is hugely appreciated. The CD version is of course on sale here at the site and from a few online stores including Kool Kat Music in the United States. The album can also be downloaded from iTunes, Amazon and many other outlets on the web and for a short time you can check the songs out via Spotify and other streaming sites. I'm continuously adding back catalogue items to the stock on sale here at the shop, the latest being The Goldenhour albums 'Beyond The Beyond' and 'Always In The Now' which are now on sale here in CD format. Watch this space for other reissues coming your way soon. Click HERE for a preview of some of album tracks. When you release a new record it's always one of the biggest thrills when you become aware that your songs are being played on the radio. I still remember the first time. My earliest band A Chocolate Morning got our first demo played on the legendary BBC Scotland show Beat Patrol and it was one of the highlights of my teenage life, what an adrenalin rush it was to hear the song we'd worked on crackling through the airwaves back at us that night. I've been lucky to have most of what I've done over the years receive excellent radio support and since the 'Geography & Luck' album release in June it's been hugely satisfying to find that the new album has been getting aired far and wide. All twelve songs on the album have received multiple plays on radio already, many of the stations who have been supporting the record have awarded us 'Artist Of The Week' or 'Album Of The Week' status which has been fantastic. Special mentions must go to Irvine Beat FM, Dunoon CR, Camglen Radio, Keith CR & Sunny Govan Radio who have all given the album loads of airtime and coverage. It was great fun to drop in to Irvine Beat, Sunny Govan and Camglen to do interviews and live sessions just after the album's release as well. Shows which I'm a regular listener of such as the Roddy Hart & Billy Sloan shows on BBC Radio Scotland and Jim Gellatly at Amazing Radio have played tracks and it was very satisfying to feature on their playlists. In Spain the excellent Plastico Elastico show has played several tracks and the Ice Cream Power Pop & More show had G&L as album of the week too leading to airplay across the globe as the show was syndicated to the likes of Sweden, Hong Kong, Canada & the U.S.A. There's been loads more radio play Stateside too courtesy of Radio Free Phoenix, Radio Free Americana and The Music Authority amongst others. So with over 120 plays already in the first six weeks since the album's release I'm very satisfied indeed, and that's only counting the plays that I've been made aware of so far! So what's the biggest radio 'hit' so far from the record?..well, the three singles 'NY Reflection Song', 'Break Me' & 'Ride The Tide' are up there with 'She Talks In Whispers' and 'I Wish I'd Never' running them close. Great to note that my former band The Goldenhour have been picking up some airplay too recently amid all the new album activity which is pleasing. Here's to more of the same in the coming weeks and months, big thanks to everyone who has helped to get the album heard so far.